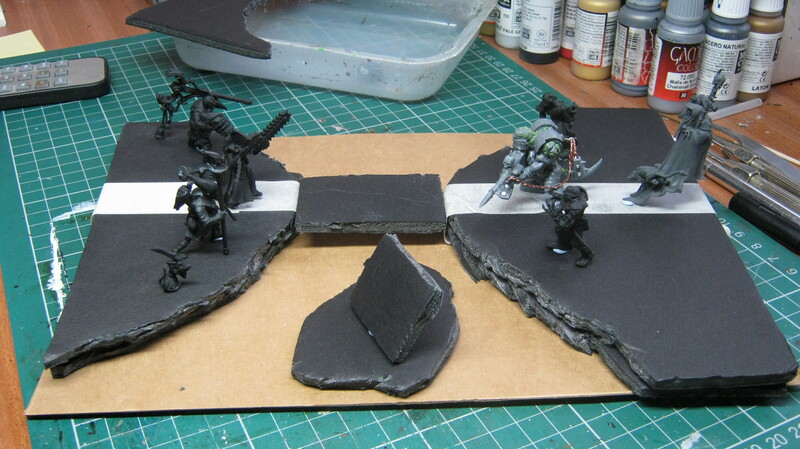 Redemptionists (5) – Display Base Finished, Almost. 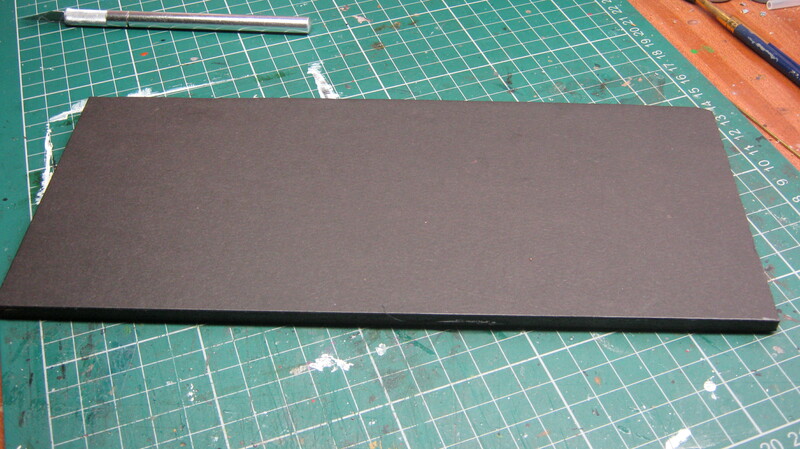 I’ve pretty much finished modelling the base for this. 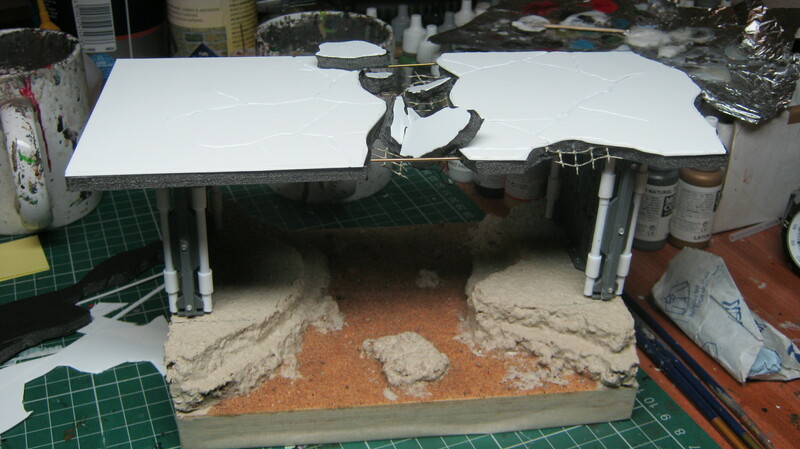 It’s taken longer than it should have, as I wanted to add a small vignette to the underside of the bridge, to echo the battle taking place on the upper level – and it took a fair bit to figure out a similar narrative which wouldn’t detract from the main models. 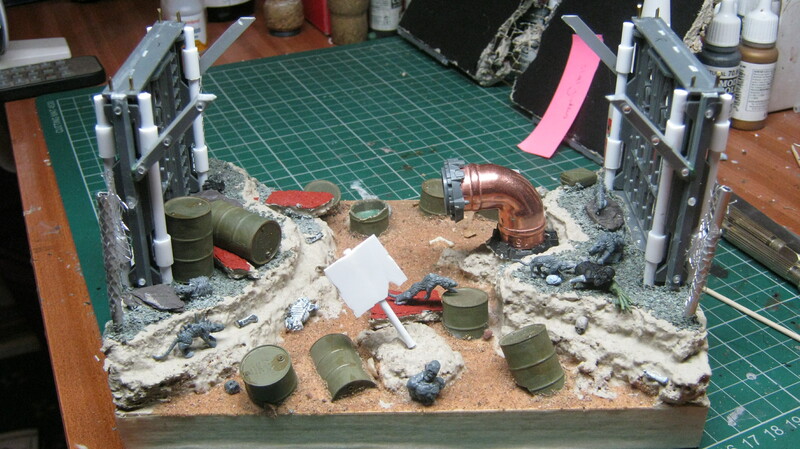 Almost ready to begin painting the diorama – just some minor tweaks needed; although I haven’t quite planned out the paint-scheme yet. 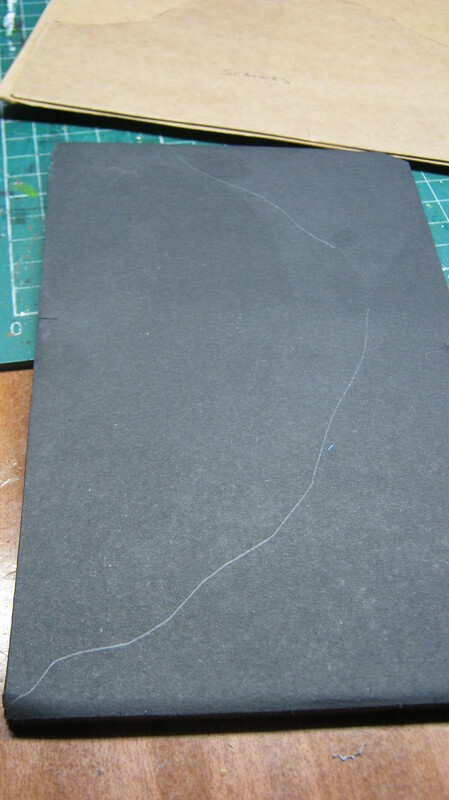 I’ve been thinking about painting it in a less realistic style than I usually do – but we’ll see. 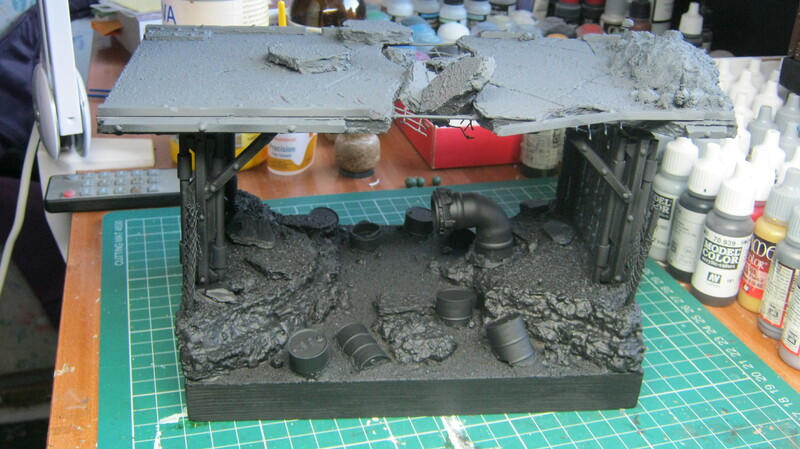 So, on with the base. 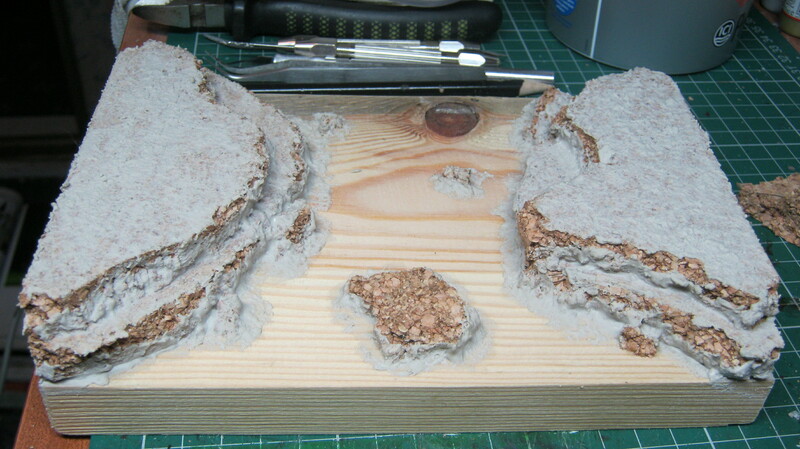 This is still a work in progress, but as it might take a fair bit of time to complete the detailing, it seems worthwhile to at least demonstrate the basics of creating a display base. 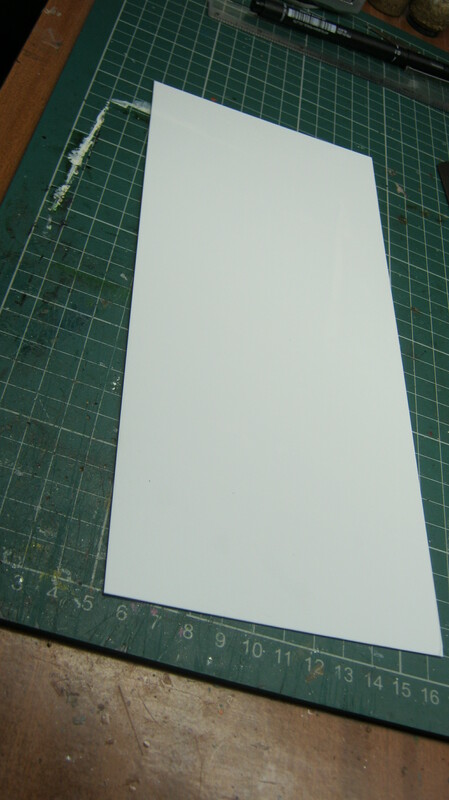 It’s helpful to plan it out, and make a mock-up version, using cheap material – such as cereal box card – before beginning the final model; as this allows you to chop and change your ideas as necessary, without wasting costly material. 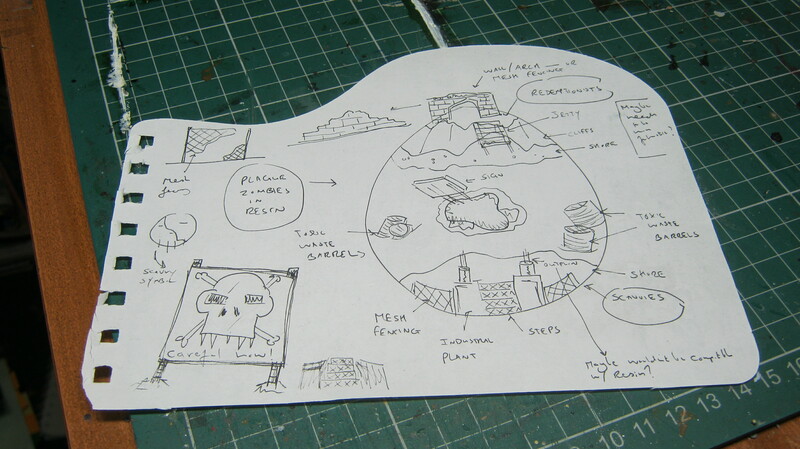 Obviously, this is not high-art; just a quick record of your ideas. 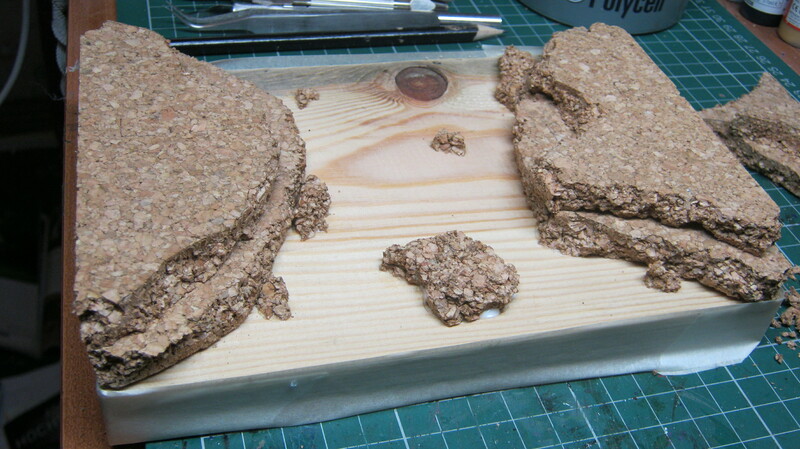 It’s only ever a matter of personal taste; but I think that a straightforward idea is better than an overly elaborate one. 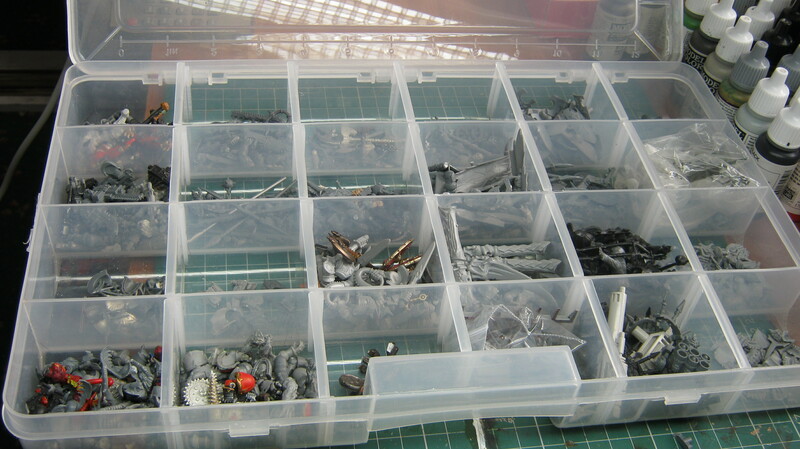 Partly because if you’re not careful, the base can over-power the miniatures; but partly because otherwise it ends up absorbing most of your time and effort. 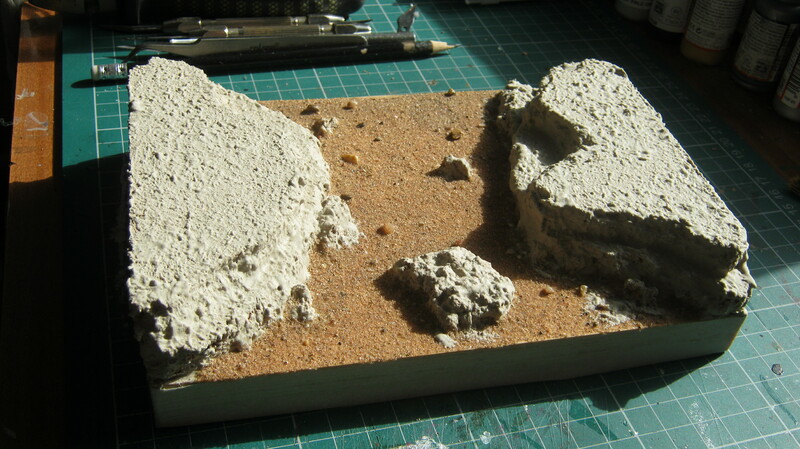 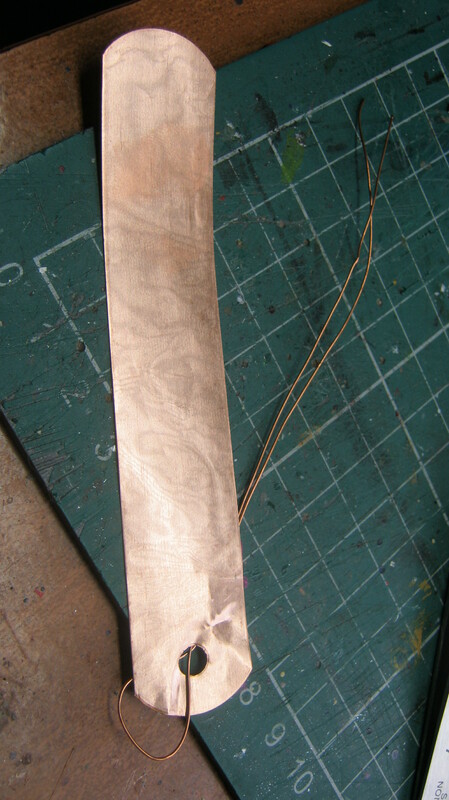 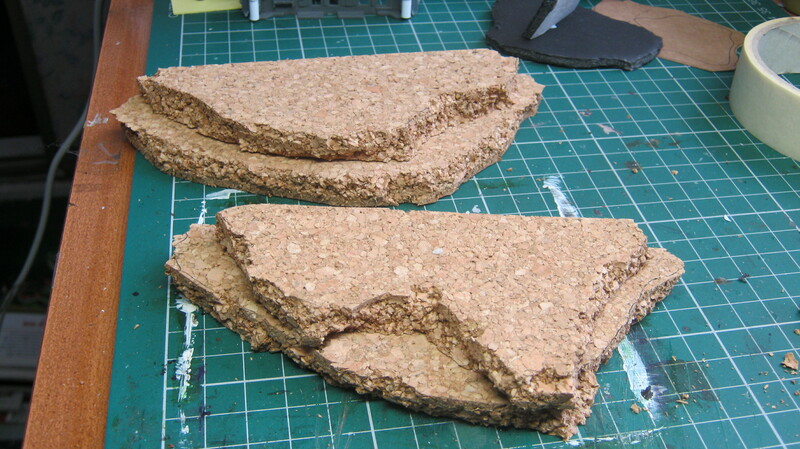 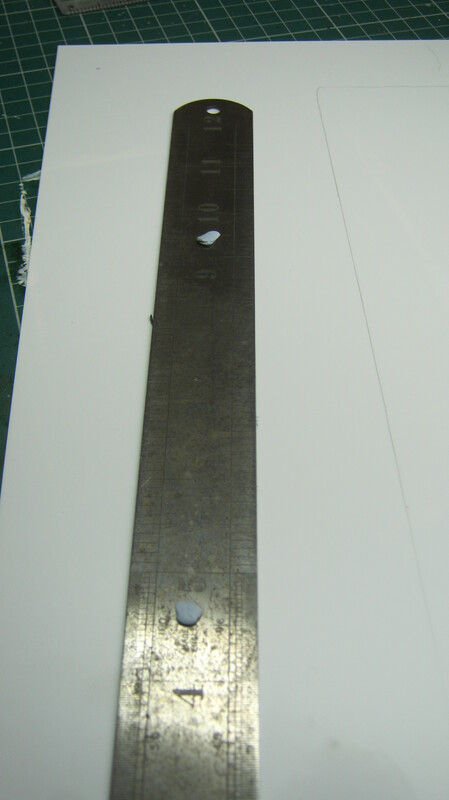 Once this has dried, give it several thin coats of watered down PVA (about five parts water to one part PVA). 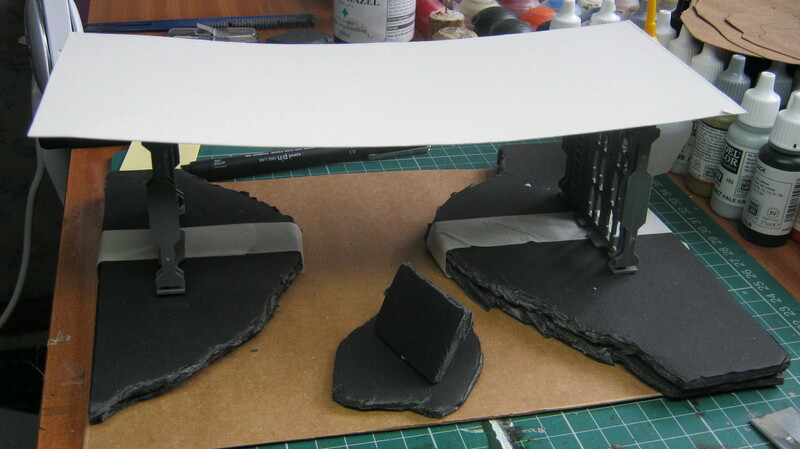 It needs detailing; plus I’m not sure whether to make the water element dynamic or stagnant – but that’s the foundation, at any rate. 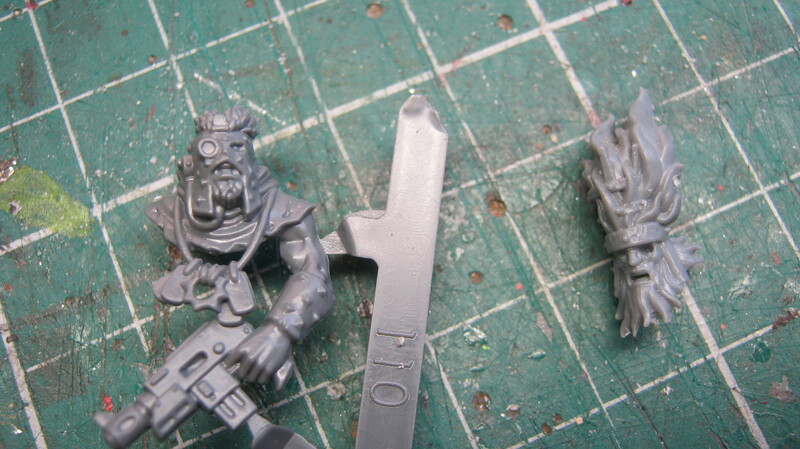 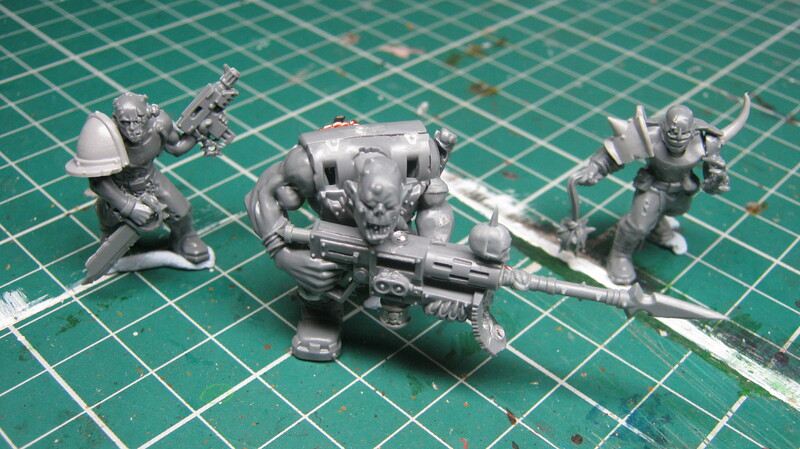 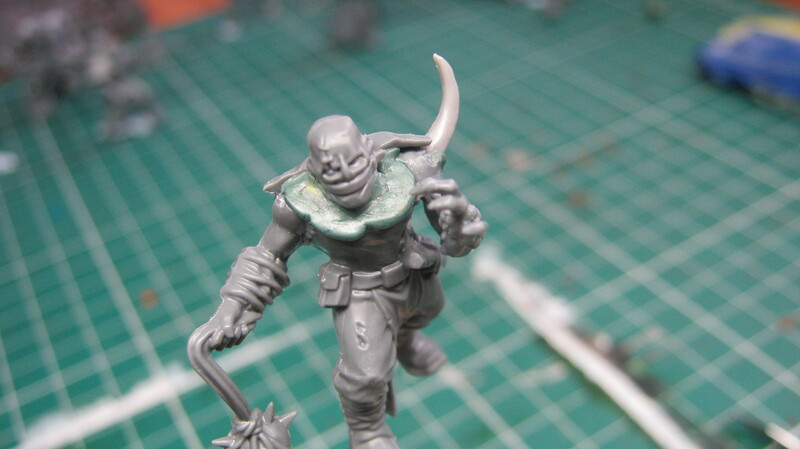 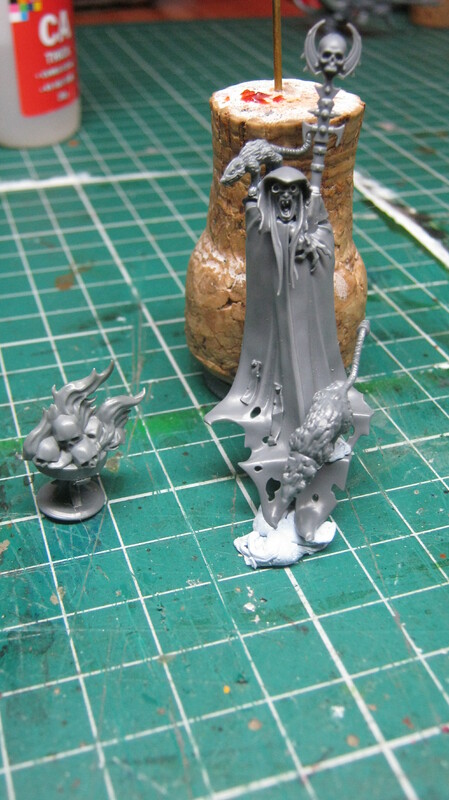 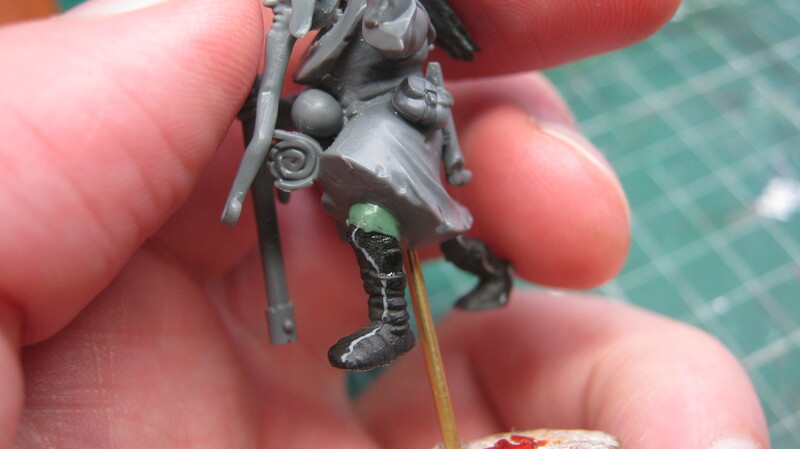 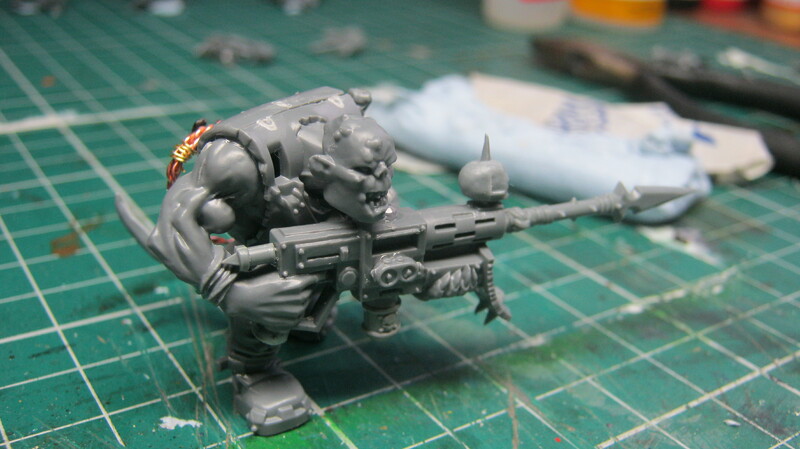 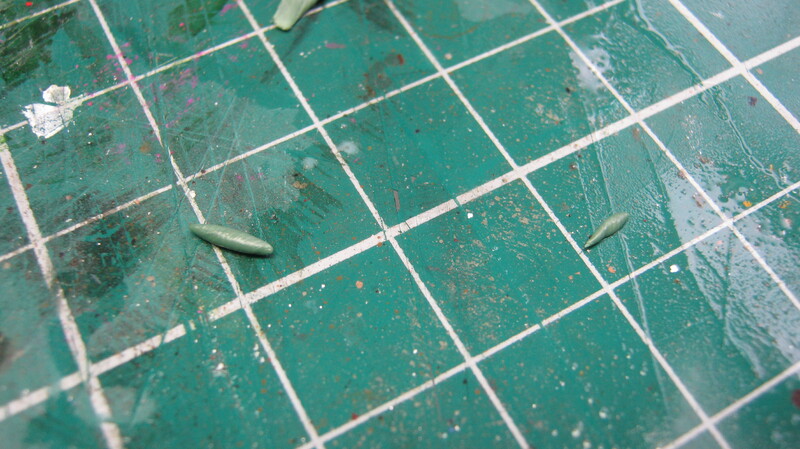 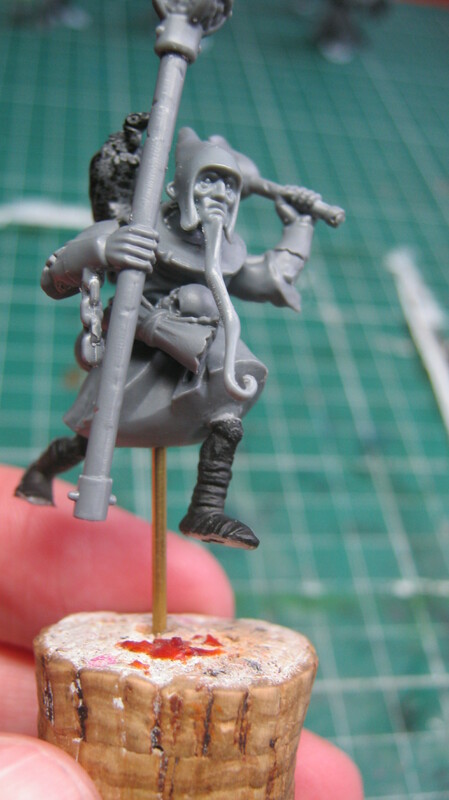 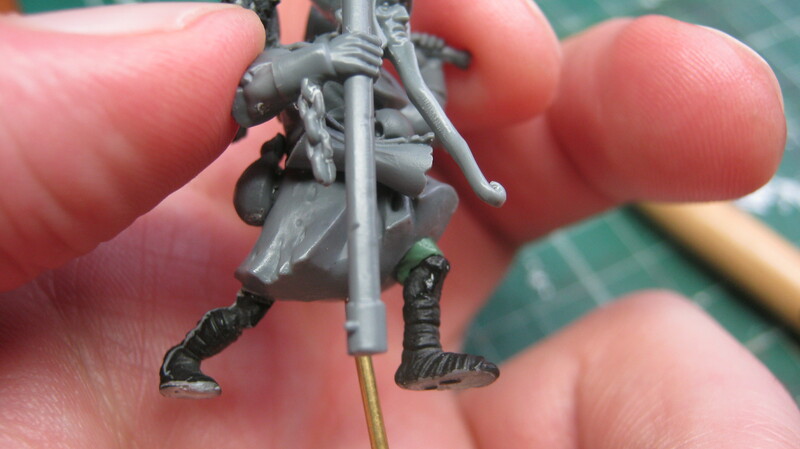 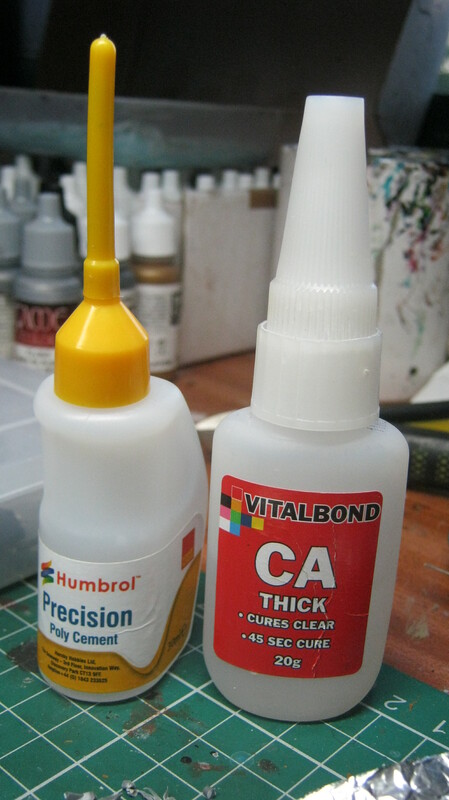 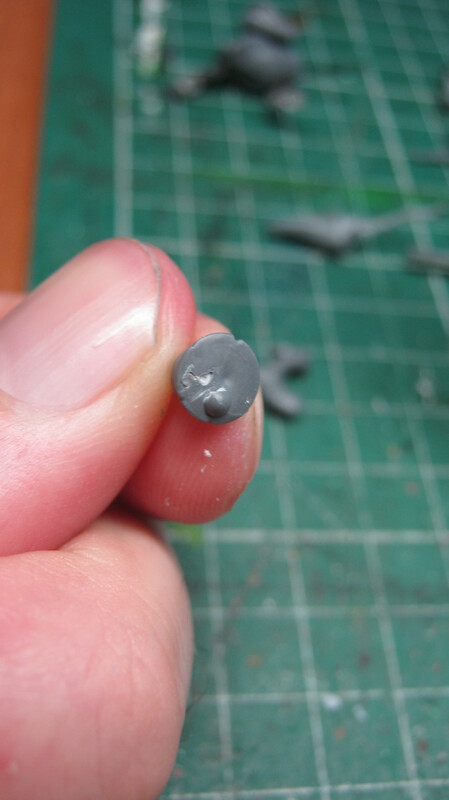 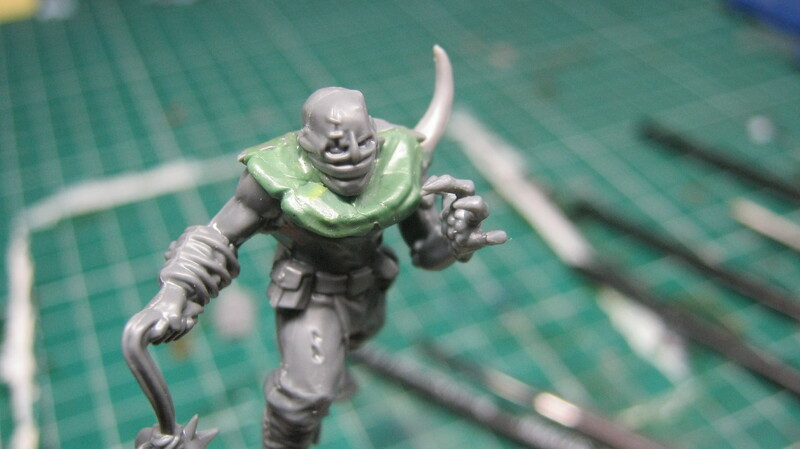 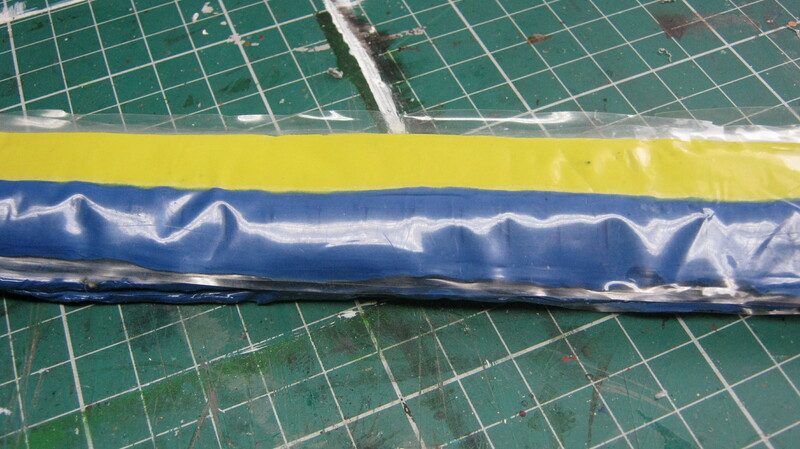 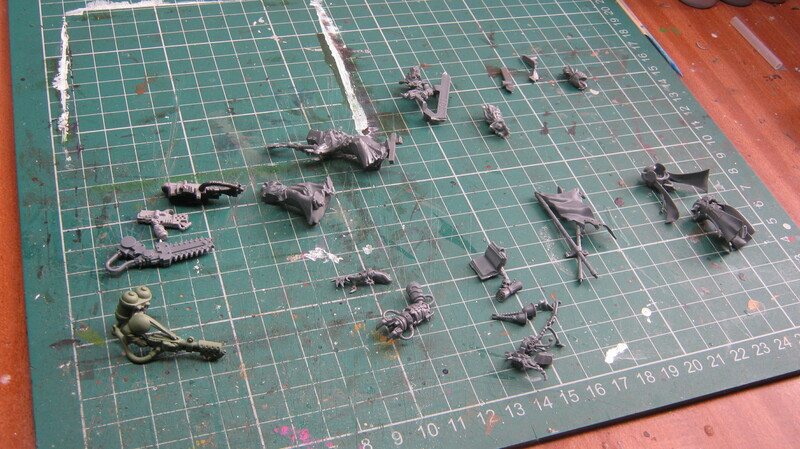 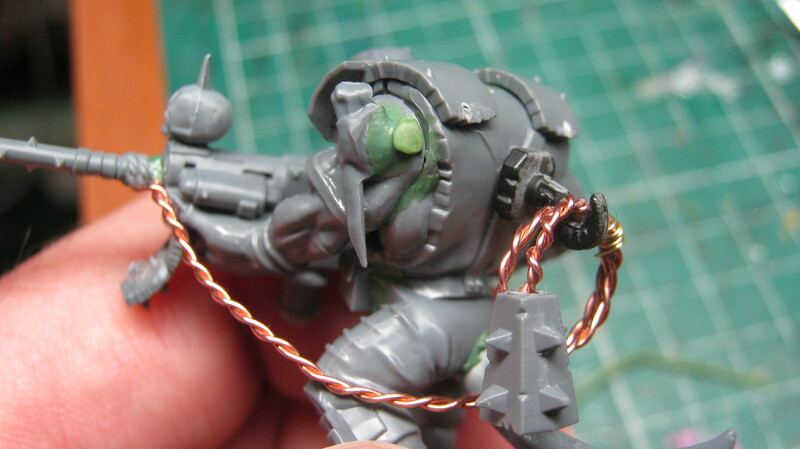 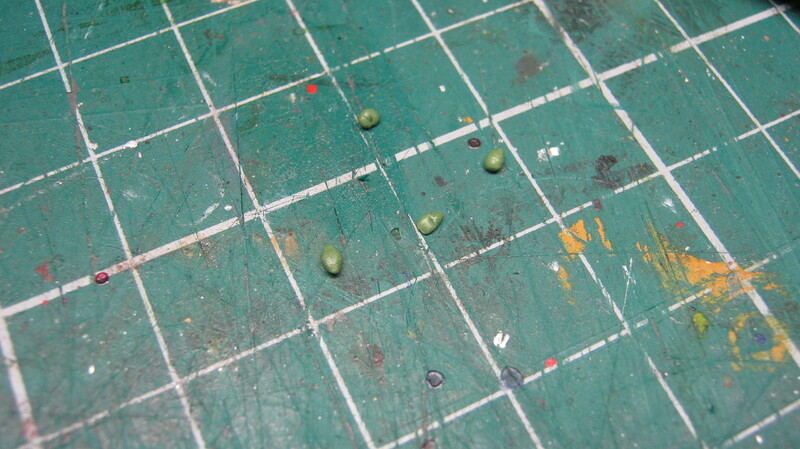 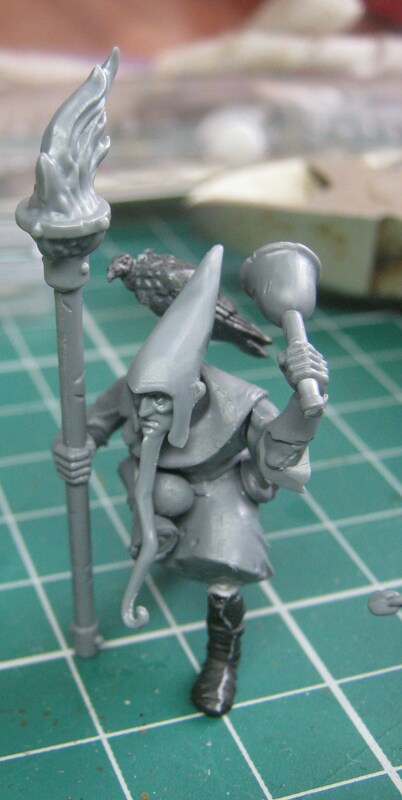 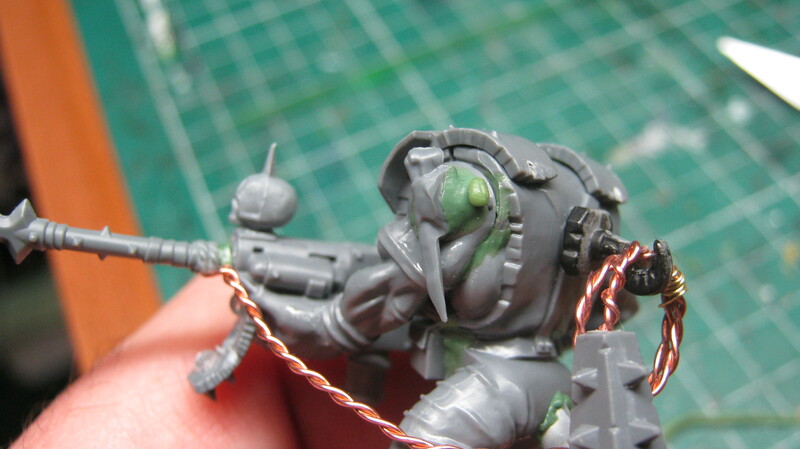 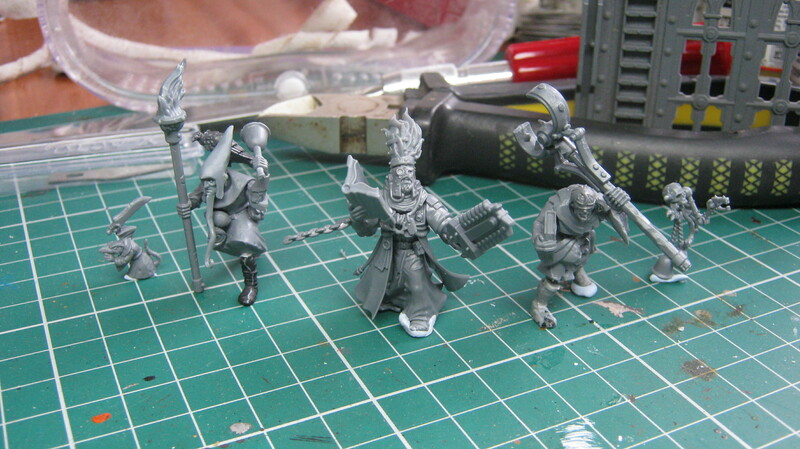 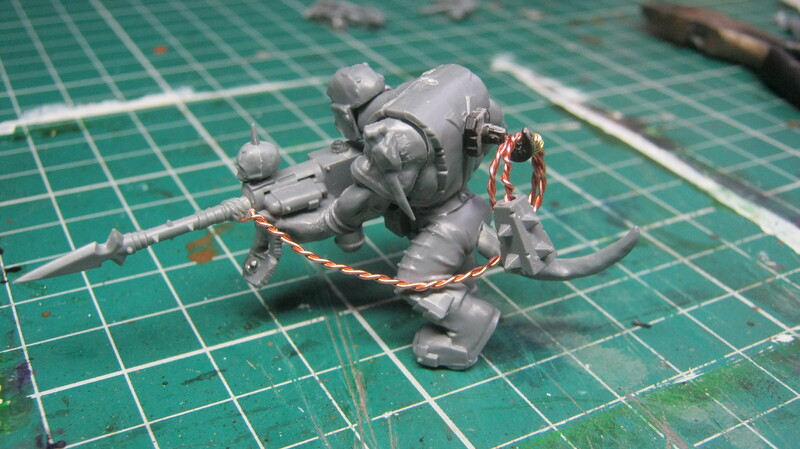 Greenstuff is a two-part epoxy resin, which can be used to fill gaps, or sculpt details onto models. 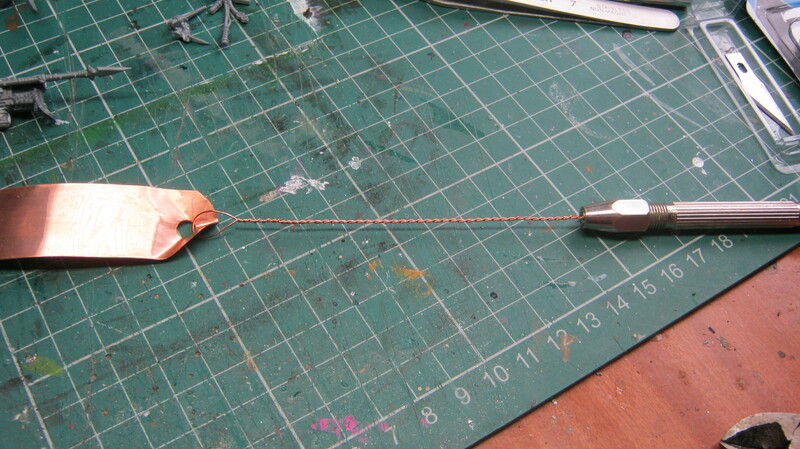 It’s also quite tricky to work with, if you’re not used to it. 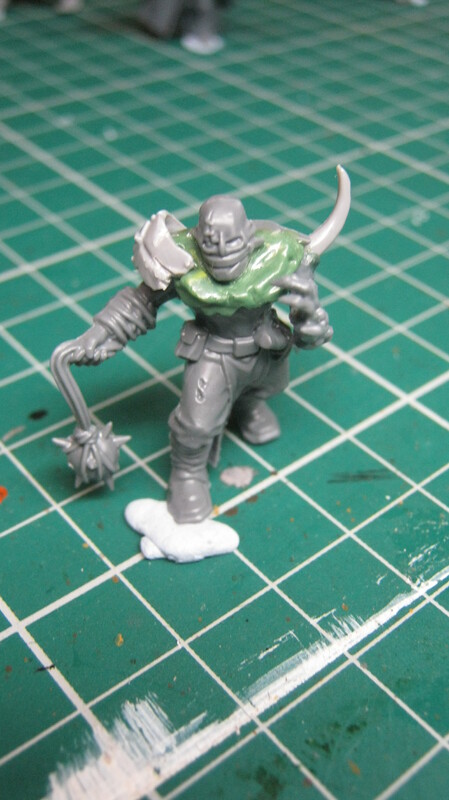 So, I thought it might be helpful to make a beginner’s guide to the basics of sculpting with greenstuff. 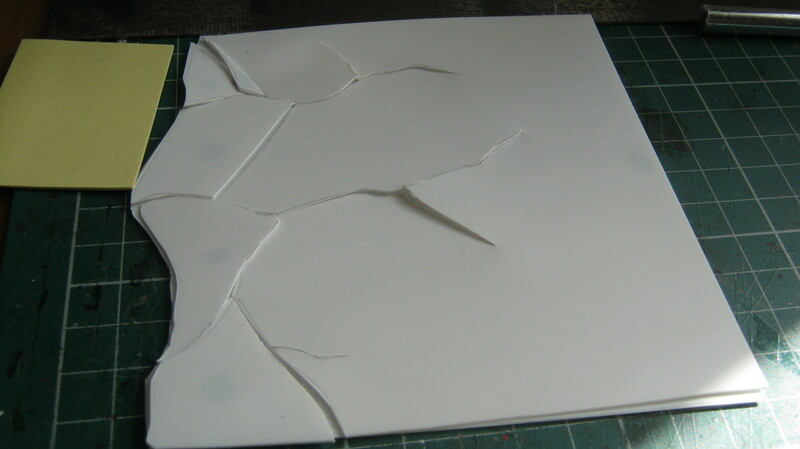 Firstly though, epoxy resin is toxic – although it’s unlikely anyone reading this is inclined to eat it, it can provoke an allergic reaction in some people when handled. 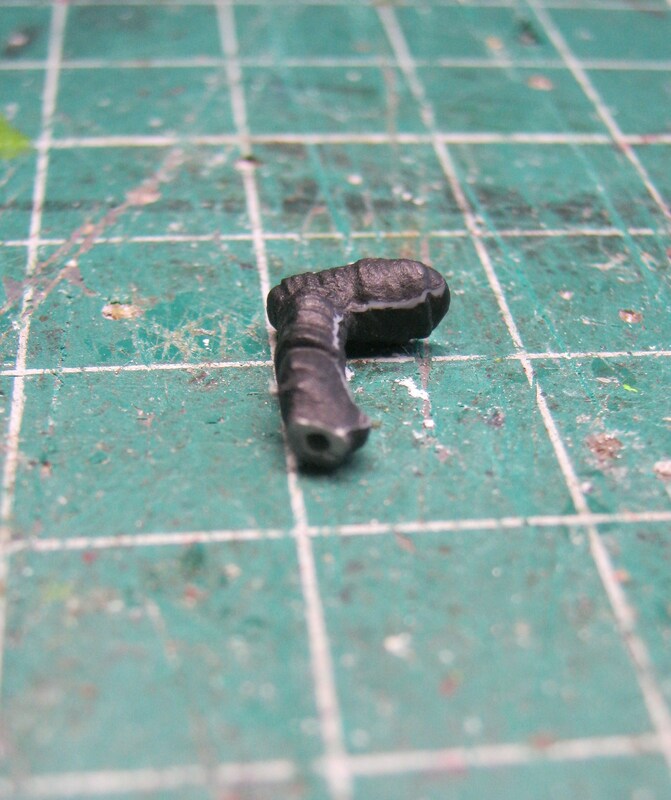 It’s also advisable not to leave it lying around, where it can get into the wrong hands or paws. 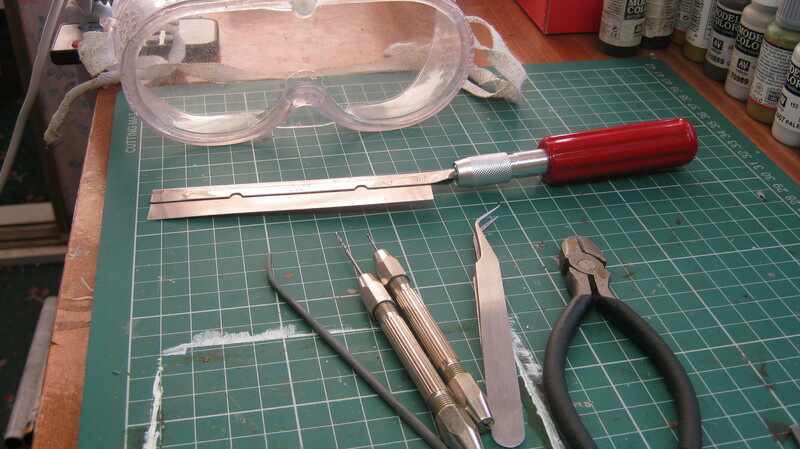 It takes several hours to fully cure – and it’s best to leave it overnight to be sure. 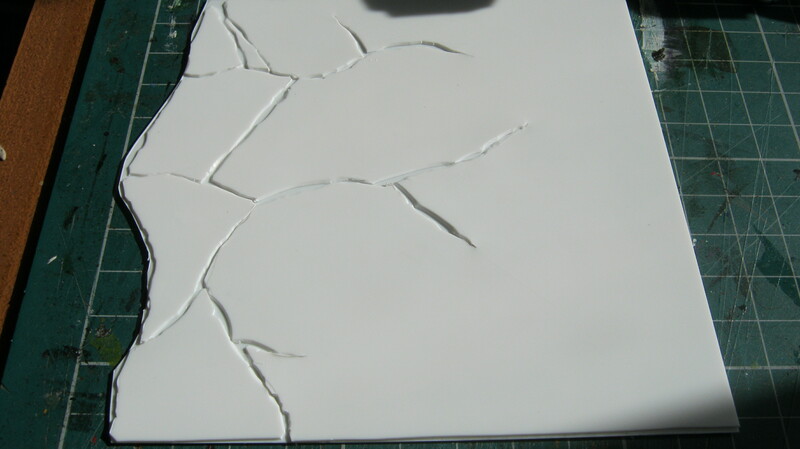 It’s a good idea to use a bit of water both when kneading epoxy putty, and while working with it, in order to prevent it becoming too sticky. 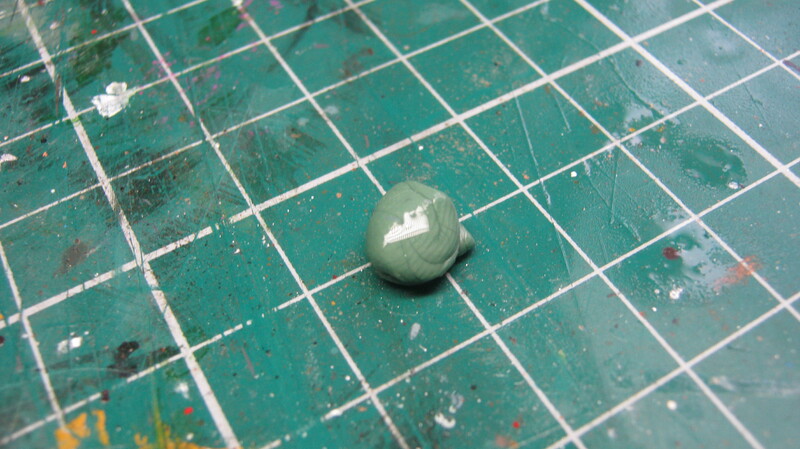 If you want to sculpt detail with it, it’s helpful to leave it for c. 10-20 minutes to harden a bit, as that way tools leave an indent in the surface, rather than changing the overall shape of the putty. 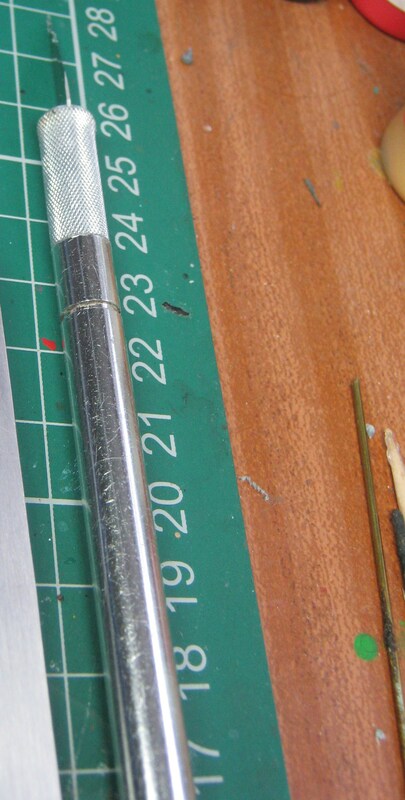 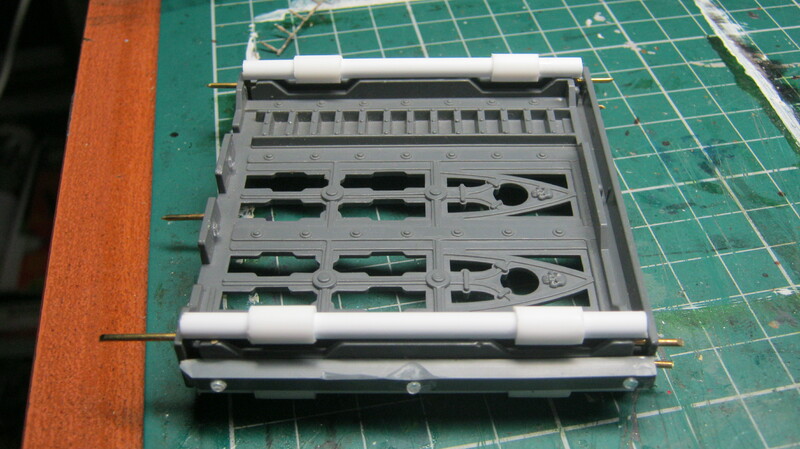 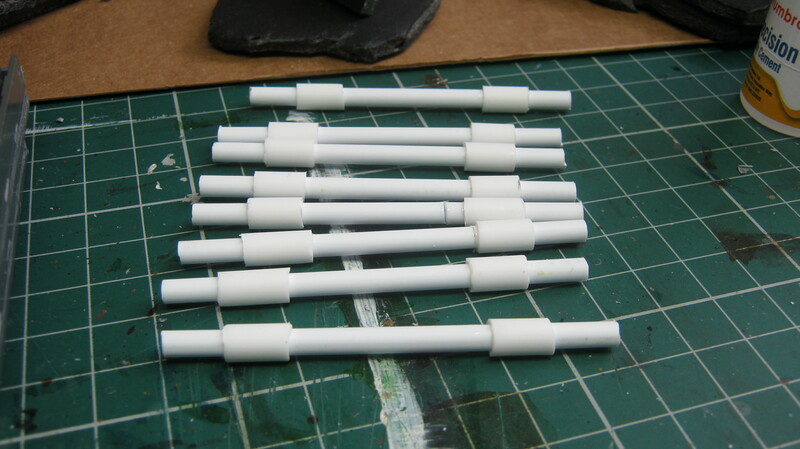 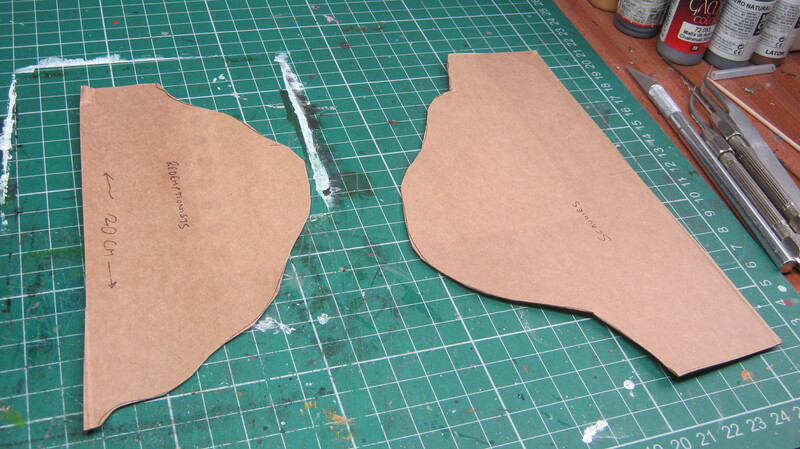 I only really use it for two purposes: filling gaps; and adding small details. 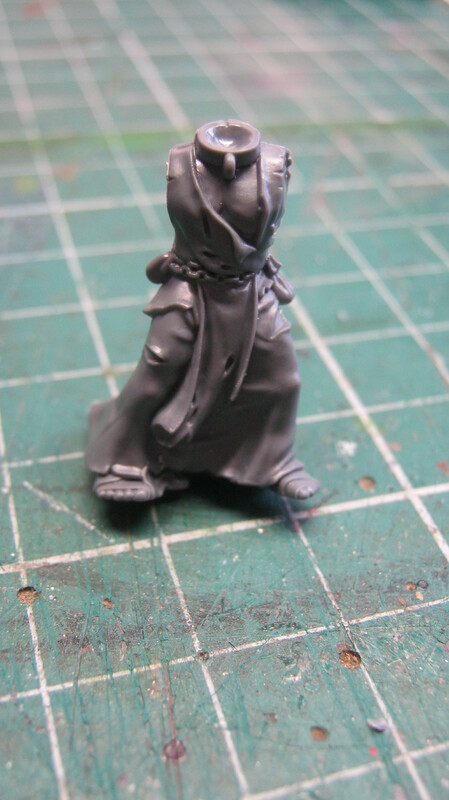 I am also pretty rubbish at sculpting, so I avoid being too ambitious. 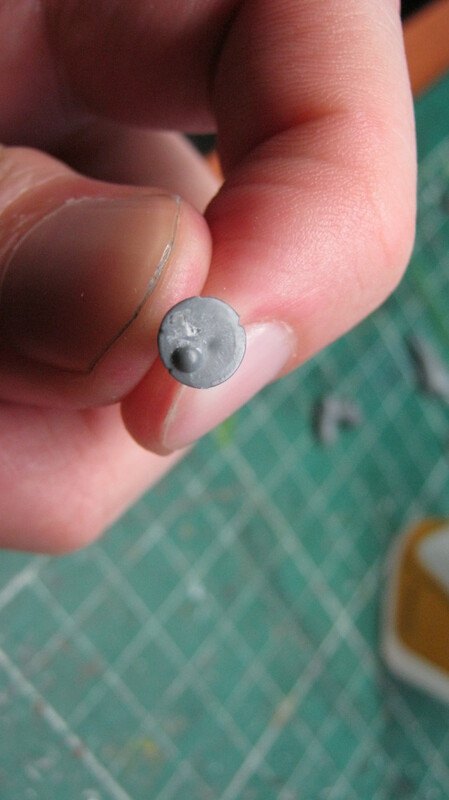 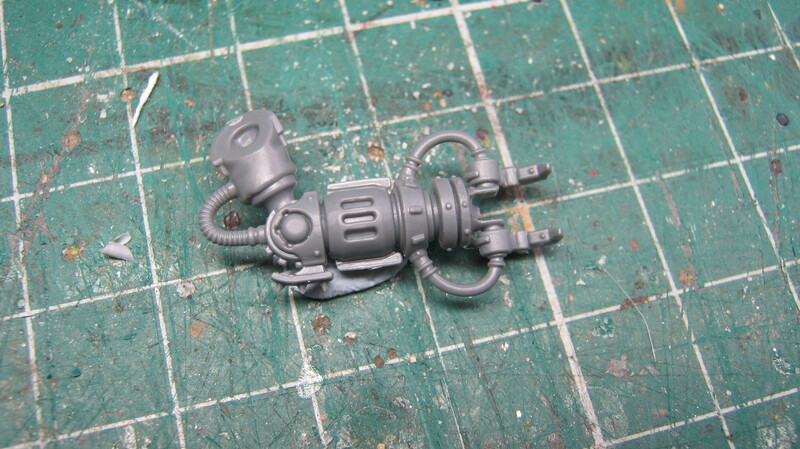 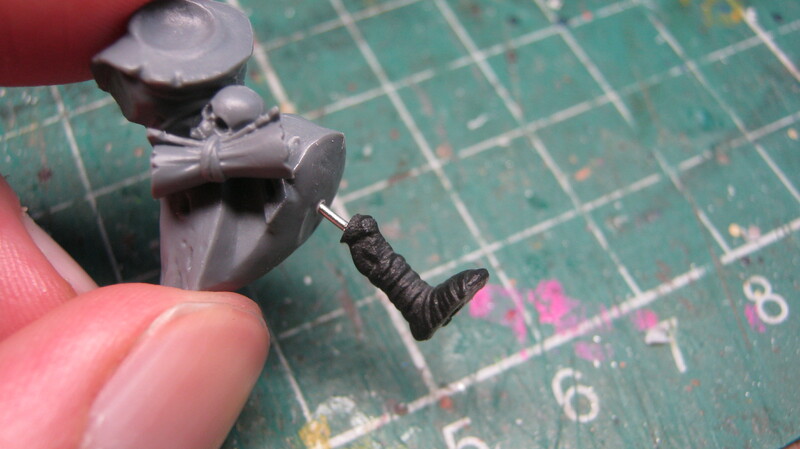 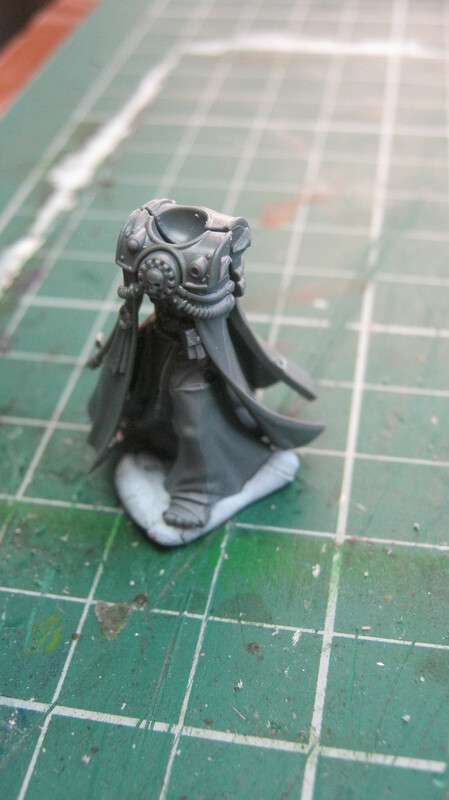 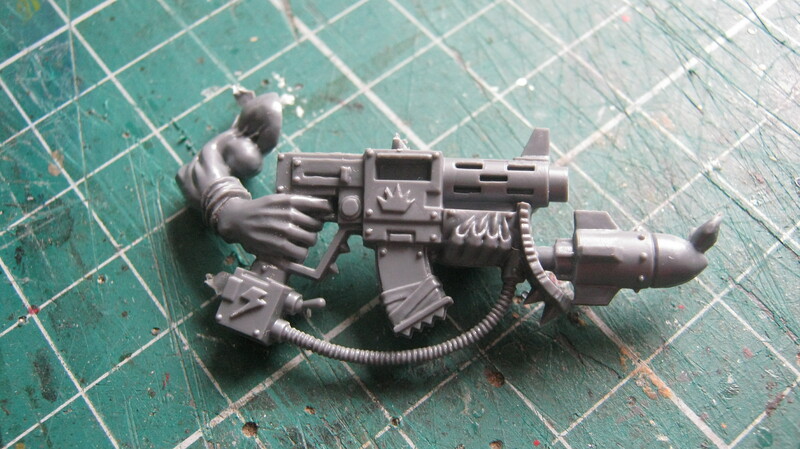 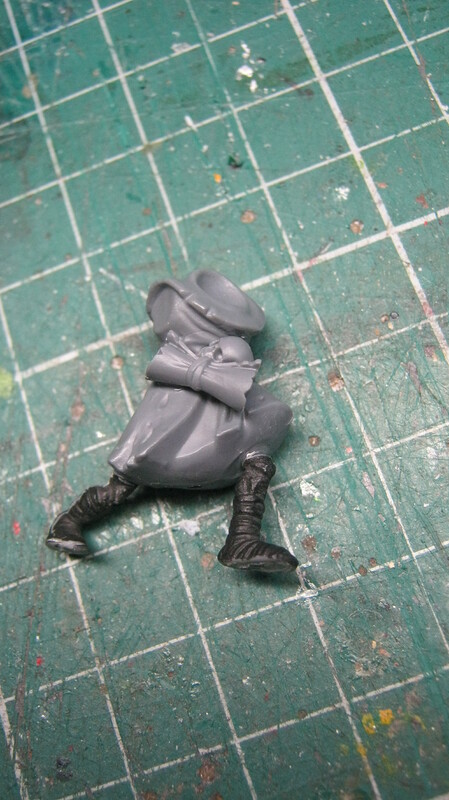 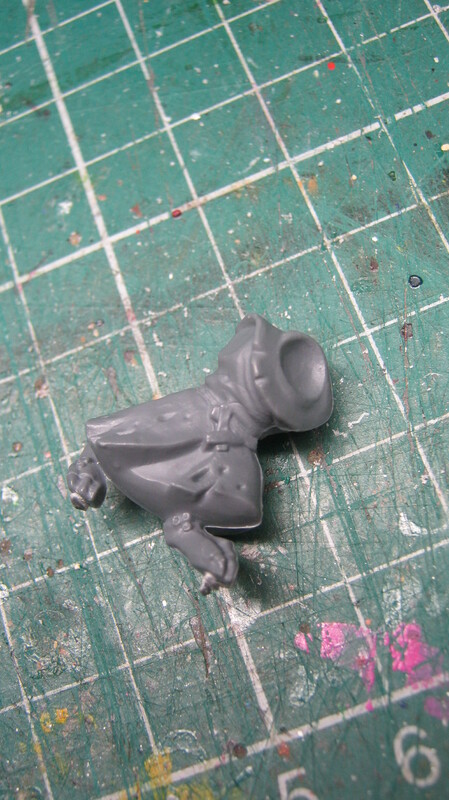 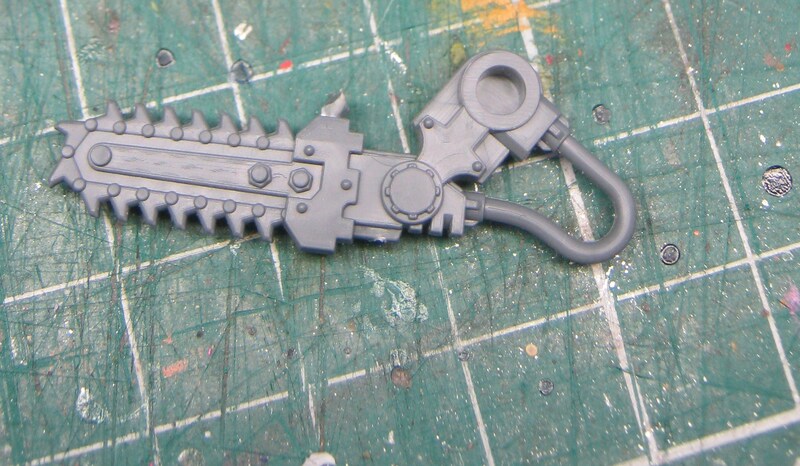 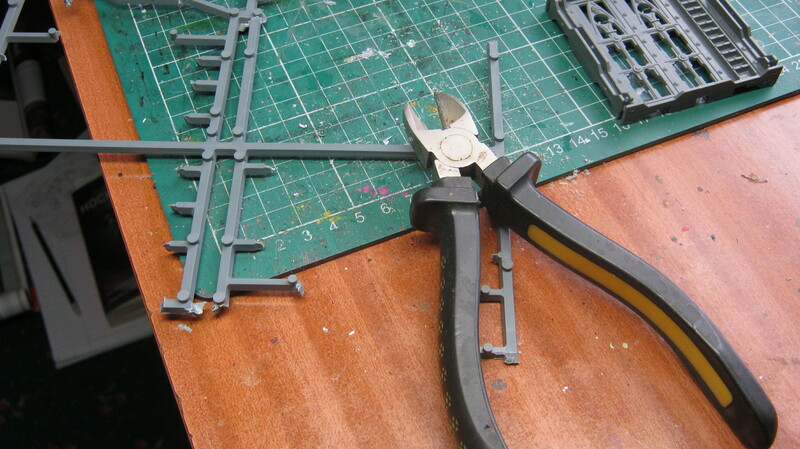 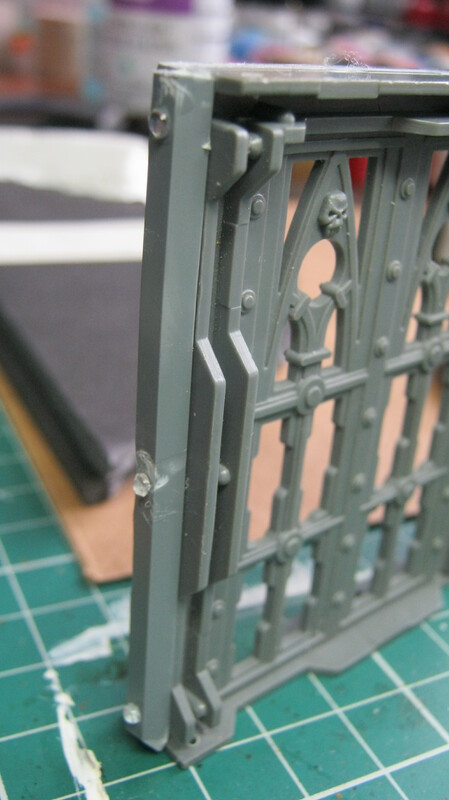 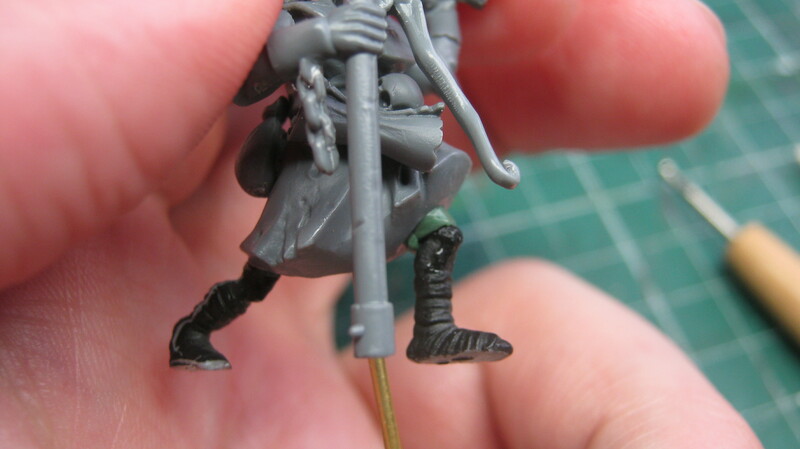 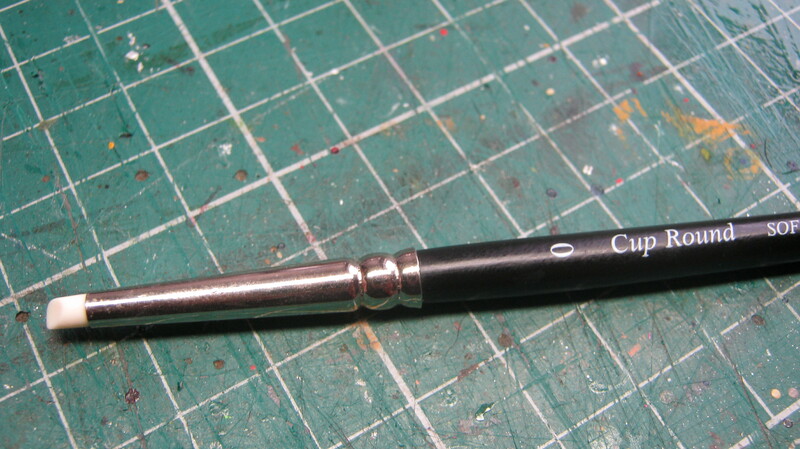 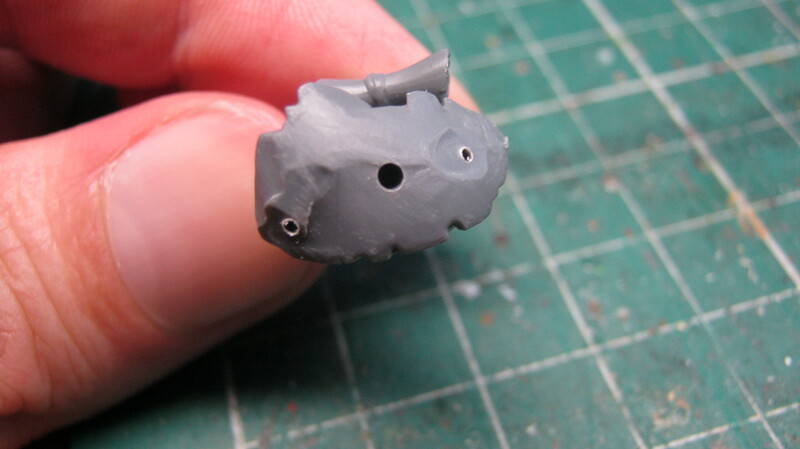 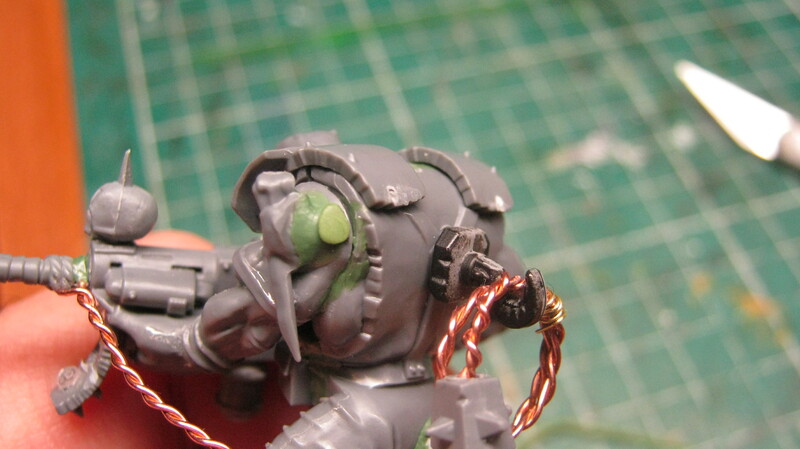 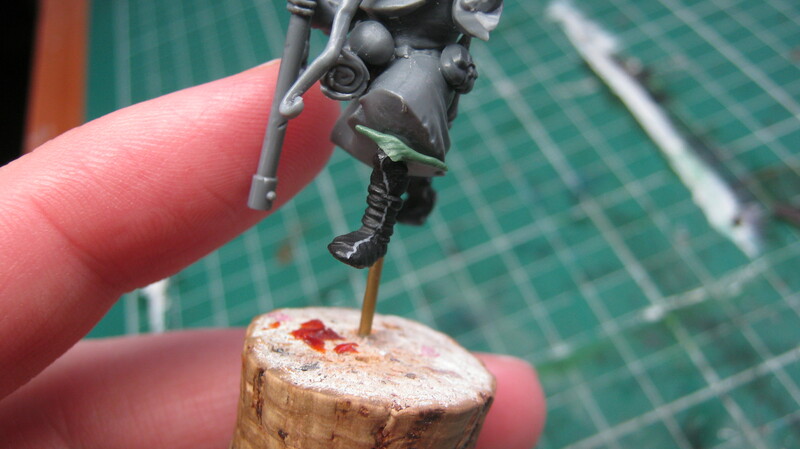 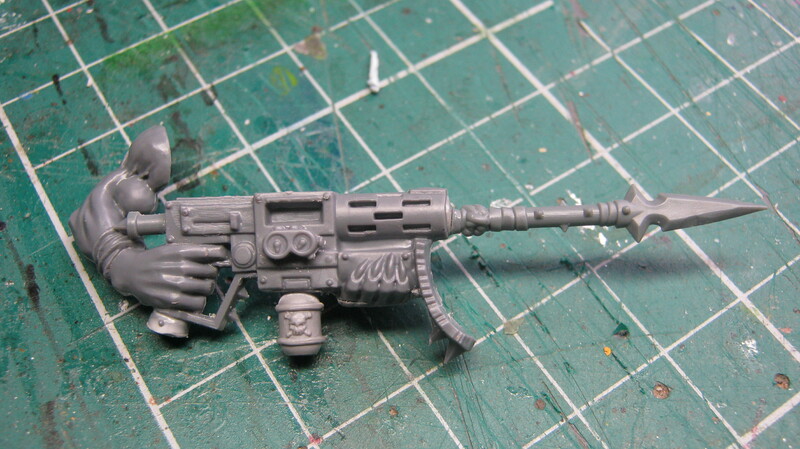 As a rule though, it’s best to avoid making sculpted details too elaborate, as you may not be able to paint them. 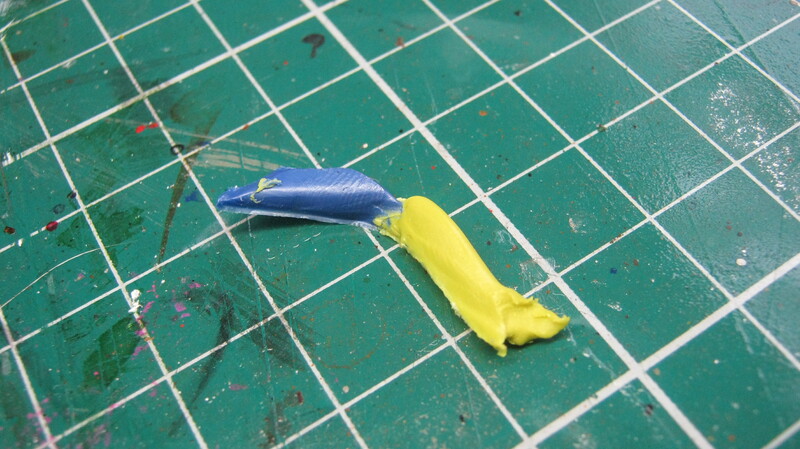 What I would recommend is two general principles – building up the putty in several thin layers, rather than a single thick one; being patient and gentle with the pressure you apply to the putty. 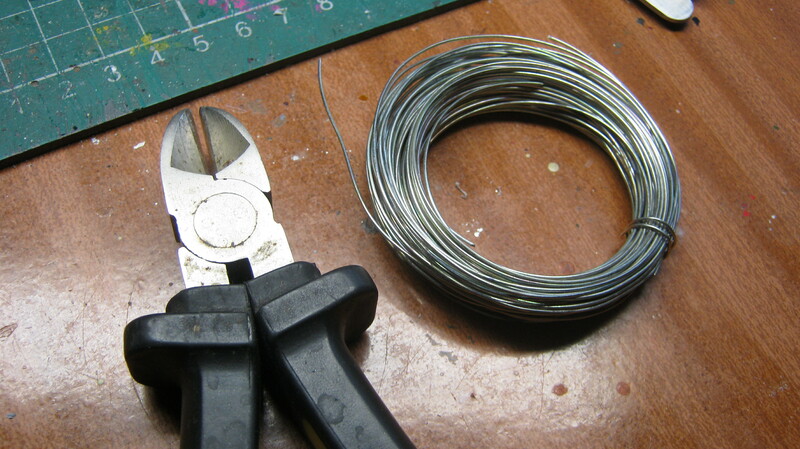 The smaller variety of these can be very expensive – but the larger ones are fairly cheap; and can be bought from art and craft stores, or ebay. 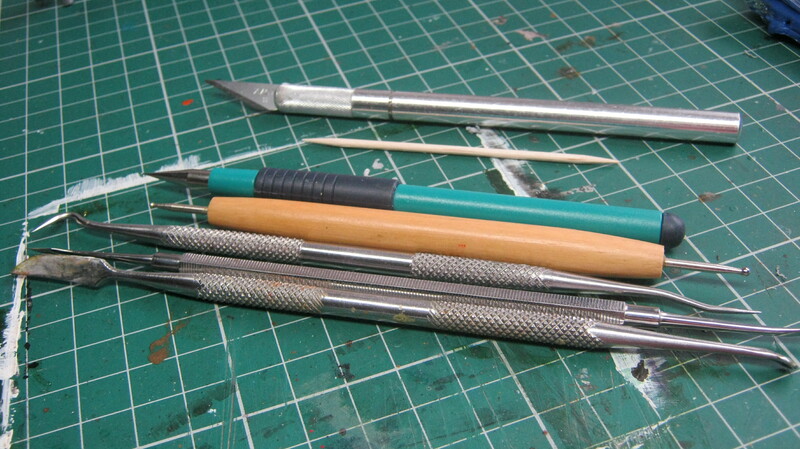 Although the small versions are costly, they are extremely useful. 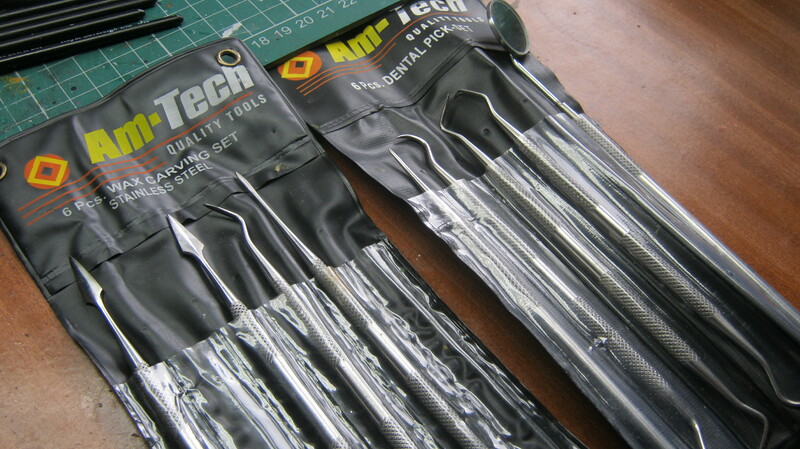 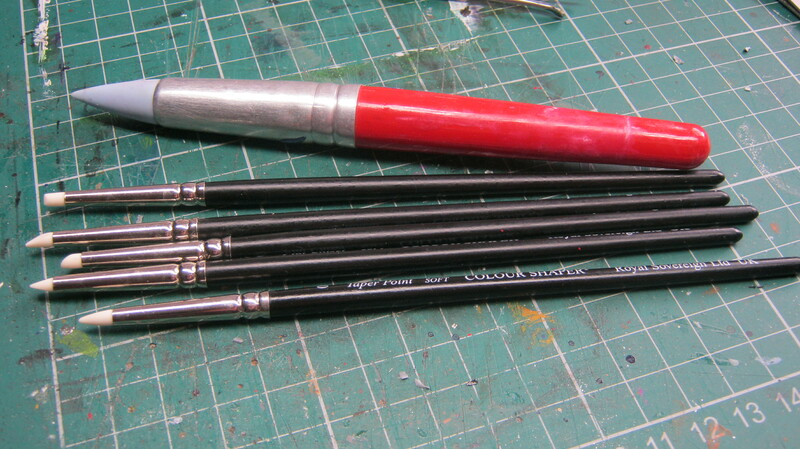 They’re silicone-tipped tools, which can be used to smooth putty out and push it around, more easily than any other sculpting device. 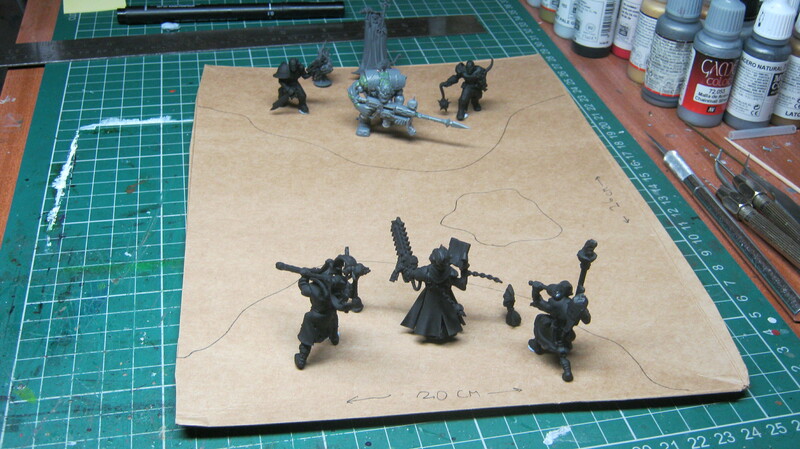 I decided to expand the Redemptionists into a diorama; depicting the last stand of Karloth Valois. 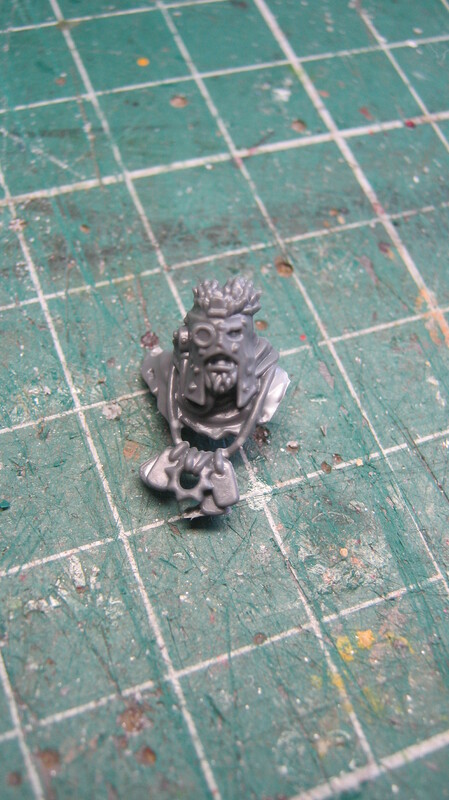 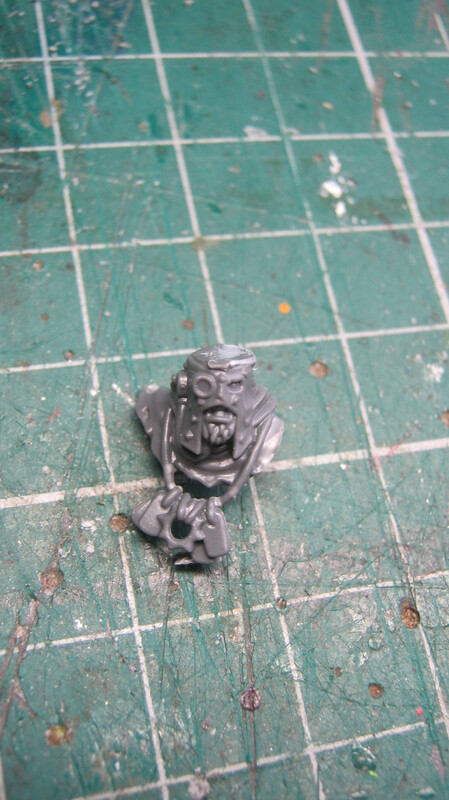 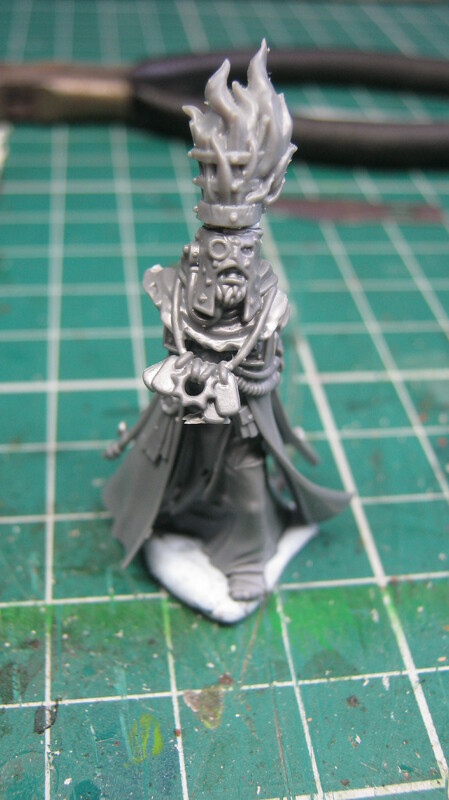 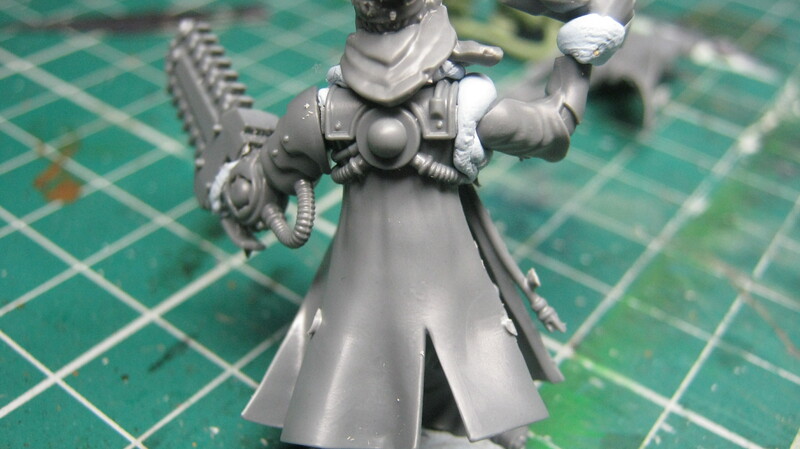 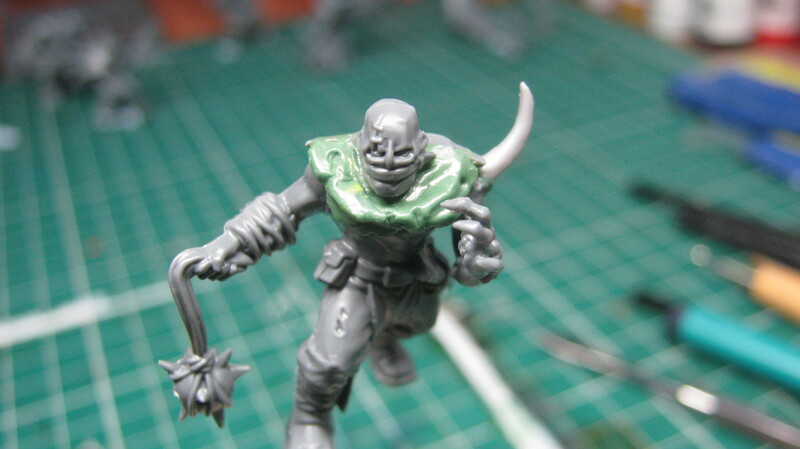 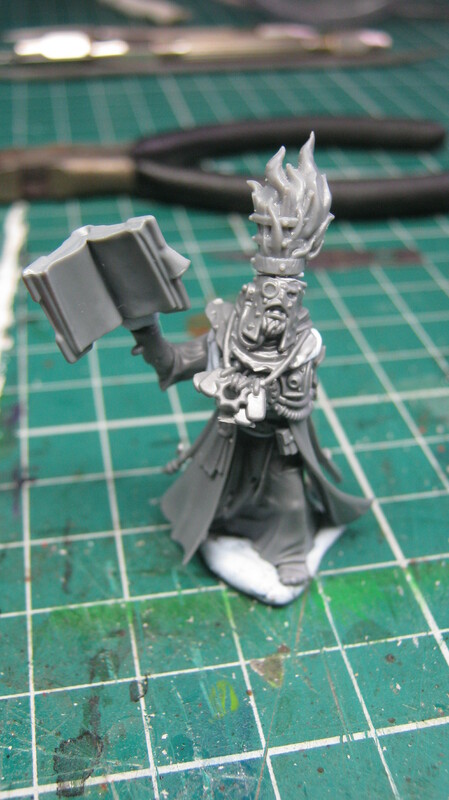 If you’re unfamiliar with Necromunda, Karloth Valois is the Underhive’s arch villain – a Necromantic nomad, who gravitated towards Scavvies; and was chased into the abyss by Redemptionists. 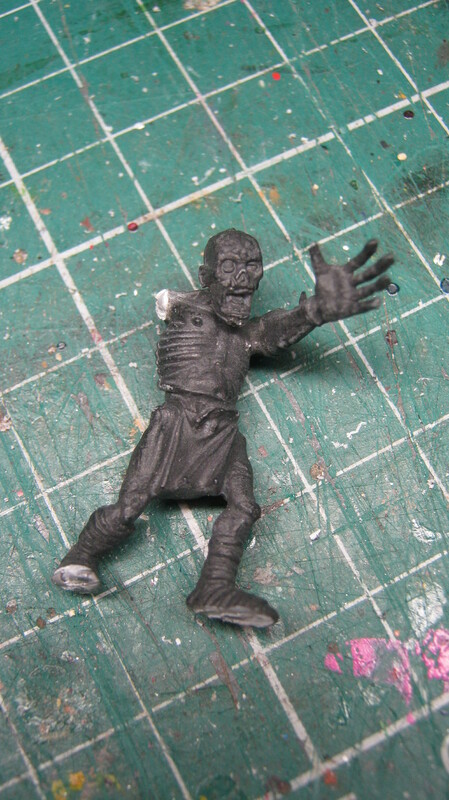 Afterwards, he was rumoured to resurface, evasively; with an entourage of plague zombies. 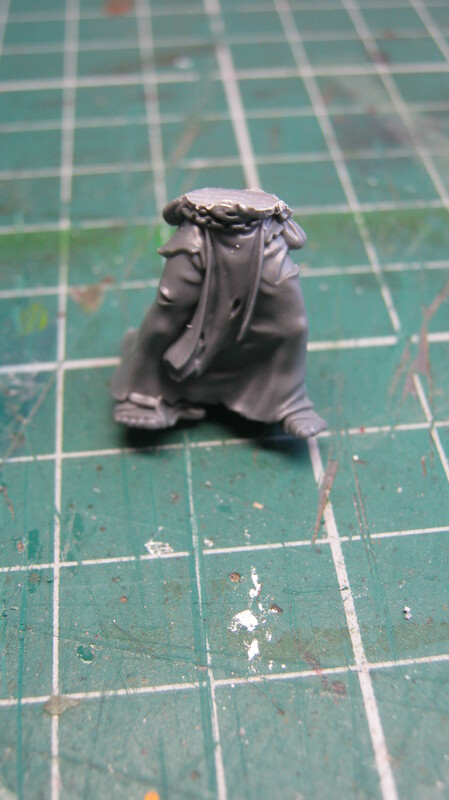 The background story makes him a faintly sympathetic figure, persecuted by the intolerant fanaticism of the Redemption; while the original model was a bit camp. 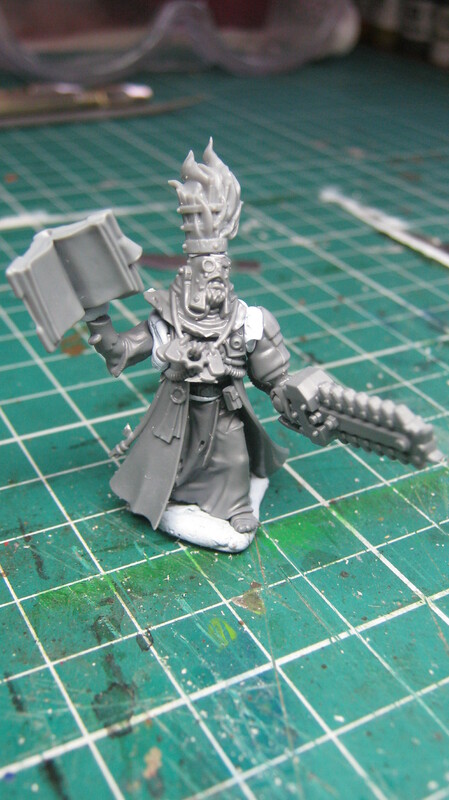 I wanted to turn this around, and make a more sinister version of Valois; and depict the Redemptionists as the heroes of the piece, having chased Valois down to his lair. 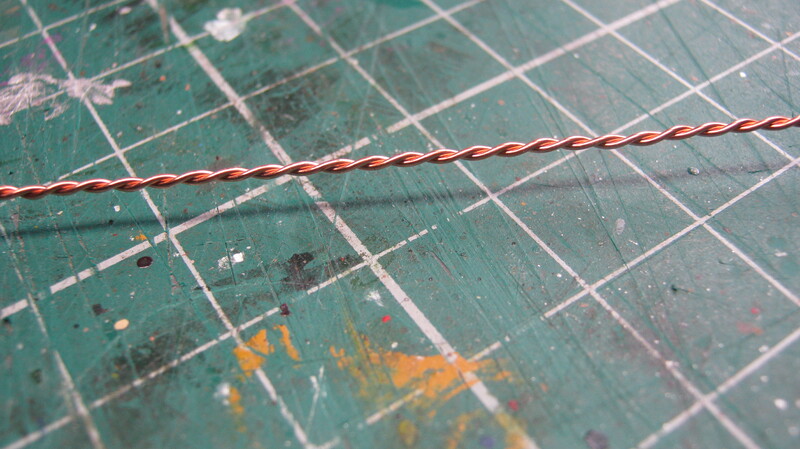 Copper wire is a particularly easy type of material to use; but it can be expensive – florist’s wire would probably work just as well. 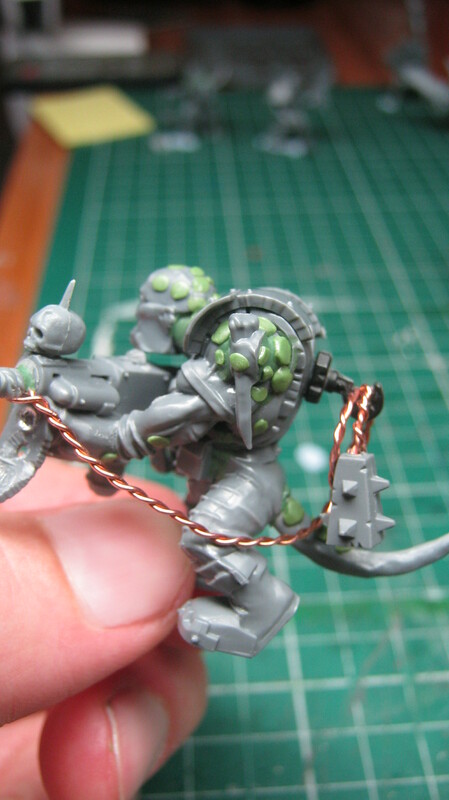 It needs some actual scales adding with greenstuff, but otherwise done.